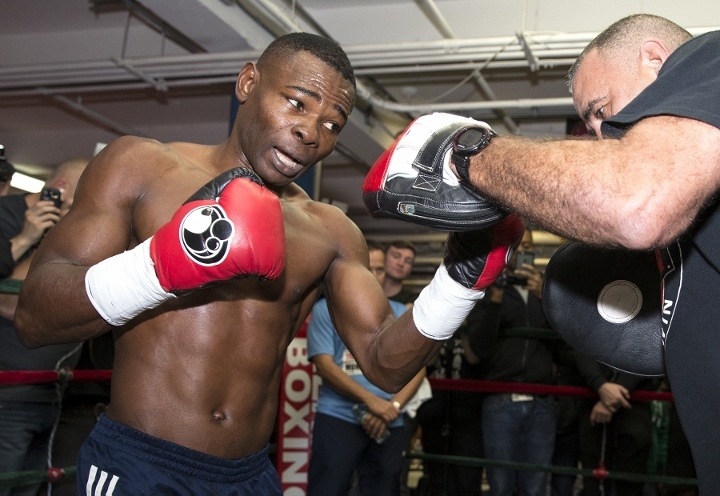 LOS ANGELES – Guillermo Rigondeaux’s return to the ring went exactly as expected given his opponent. The two-time Olympic gold medalist and former junior featherweight titleholder, coming off his knockout loss to Vasyl Lomachenko at junior lightweight 13 months ago, needed only 3 minutes to stop journeyman Giovanni Delgado in a junior featherweight fight on the Jose Uzcategui-Caleb Plant card Sunday at Microsoft Theater. Rigondeaux (18-1, 12 knockouts) moved back down to a more natural weight for the fight. And Delgado (16-9, 9 KOs) was ripe for annihilation, as the Mexican had lost his previous four fights – the last three by KO – and six of his last seven. Thus, no one was surprised when the boxing master from Cuba overwhelmed his counterpart. Rigondeaux showed Delgado little respect from the opening bell, marching forward and throwing hard punches from the beginning. The end came suddenly. Delgado had his back against the ropes when Rigondeaux, a southpaw, landed a straight left to the nose a second before the bell and Delgado dropped to all fours. Referee Jack Reiss started to count but, with Delgado unable to continue, he waved off the fight. Rigondeaux said immediately afterward that “you haven’t seen nothing yet.” He plans to stay at 122 unless the money is right at 126. Either way, he wants to fight the best in and around his division. “I’m came prepared ready to face people who are undefeated. … Whoever has a belt, I’m taken it,” he said. In early fights, light heavyweight contender Ahmed Elbiali (18-1, 15 KOs) of Egypt put former contender Allan Green (33-6, 22 KOs) down once in the first round, twice in the second and once in the third, the final time prompting the referee to stop the slaughter. Mexican prospect Lindolfo Delgado (8-0, 8 KOs) stopped Sergio Lopez (22-13-1, 15 KOs) at 2:48 of the third round in a scheduled eight-round junior welterweight fight. Delgado put Lopez down with a single left hook to the body and Lopez couldn’t continue. And fringe contender Michael Plania (18-1, 10 KOs) of the Philippines defeated Texan Juan Lopez (12-5, 4 KOs) by a unanimous decision in a hard-fought eight-round junior featherweight bout on the Jose Uzcategui-Caleb Plant undercard. The scores were 79-73, 78-74 and 77-75.